Once you get a good handle on the basics of grilling, you’ll discover how fun cooking outside can be. Make sure you’re cooking with gas. If your grill doesn’t have a gas gauge, pour a cup of boiling water down the sides of the propane tank and wait a few seconds. If the tank still feels cool where you poured the water, there’s still propane inside. Time to ignite! Uncover the grill, set the heat to high and ignite the gas. Check and make sure the gas is lit. If it doesn’t ignite, turn off the gas and keep the lid open for a few minutes before trying again. Preheat the grill. Turn the burners on high, close the lid, and preheat for 10–15 minutes so the the grill grate is hot enough to sear your food. Indirect cooking requires at least two burners. But, if your grill only has two burners, turn one of them off. Place a drip pan under the area where you’ll be cooking, and grill over the unlit burners. Set up for direct cooking. This set-up is used for foods that generally take less than 25 minutes to cook. Light about 50 briquettes and in about 30 minutes, they’ll be coated with ash. Then spread them in an even layer. The Indoor Outdoor Portable Grill gives you two ways to grill in one compact design. Set it up outside with charcoal or use the removable electric heating element to plug it in for indoor use. 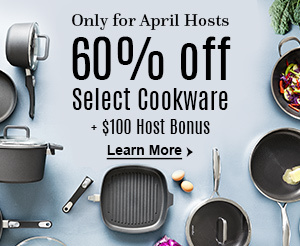 (You can grill year-round!) 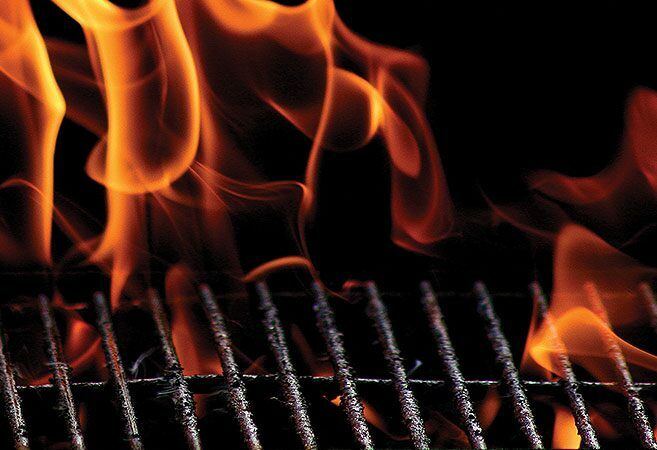 Check out this handy FAQ to set it up for all your grilling needs. Grill fajitas inside with the Indoor Outdoor Portable Grill. Step 2: Set the Grill Temperature. A little vegetable oil will keep food from sticking to your standard grill. Start with a folded paper towel soaked in the vegetable oil. 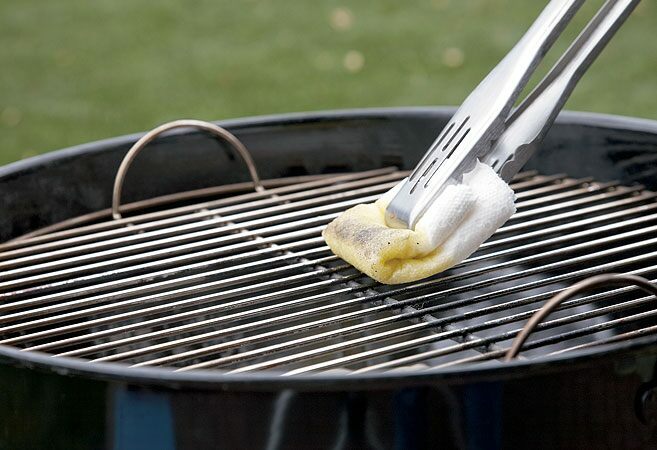 Hold the towel with Grill Tongs and brush the grill grate. 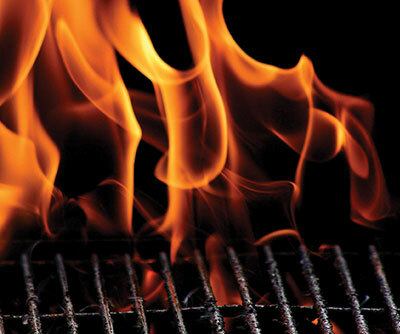 Safety tip: Don’t spray nonstick cooking spray or oil directly over the hot grill. HINT: When using the Indoor Outdoor Portable Grill, oil your food—not the grill grates. This helps reduce smoke, especially when you use it indoors! Keep clean. A little housekeeping makes foods taste better and grilling easier (and safer)! Clean your grill grate and check the grease tray. Clean them before and after each use. 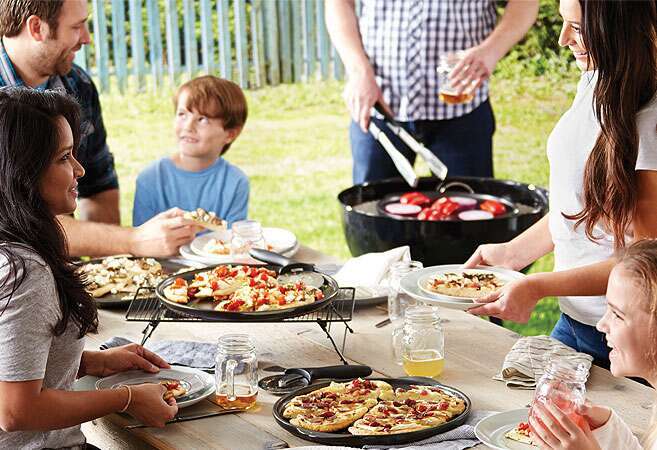 Quick tip: Using a grill-safe vessel like the Rockcrok® Grill Stone keeps foods off the grill grate, so there’s no need to clean it afterwards. Plus, Rockcroks can go in the dishwasher! Stay stocked. Check the tank (or charcoal supply). This especially applies when you’re grilling large cuts of meat or food with long grill times. Cut-back on flare-ups. Trim excess fat off of meats to reduce flare-ups. You can also carefully move foods to a cooler part of the grill, cover the grill with the lid, and close the vents. Toss used marinade. Marinades that have been in contact with raw meat are no longer safe to eat. Pay attention. The pace can be quick when you’re grilling over direct heat. Watch the grill itself to check that coals are still hot and to ensure there are no flare-ups. Also, keep checking food as it cooks. Put a lid on it. If you want an oven-like atmosphere, especially over indirect heat, keep the lid closed and only peek periodically, since heat escapes every time the grill lid is lifted. Know the environment. You’ll need to allow more cooking time on cold, windy days and at higher altitudes, and less time when the weather is very hot. No more dried-out steaks. Check the temperature in the same spot of the meat each time so less juice runs out. Insert the thermometer horizontally into thinner cuts. Use a turner or tongs rather than piercing meat to get it off the grill. Move it, move it. Hot spots are common with any type of grilling. Move foods around on the grill if you notice uneven cooking. Safety tip: Keep clean platters handy. As soon as meats are added to the grill, remove the cutting board or platter and swap out for clean ones before the food is ready to come off the grill.